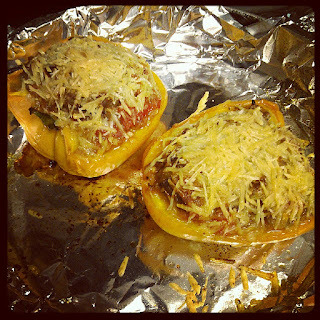 There are probably tons of different recipes for stuffed peppers floating all over the internet. There's no doubt that most of them that I've tried are good. But usually they either have rice in them or they taste too much like spaghetti sauce. Now don't get me wrong, I love a good spaghetti sauce. But I like a good spaghetti sauce in a spaghetti dish (with rice noodles or squash noodles now that I no longer eat the traditional spaghetti); I don't want spaghetti sauce in my stuffed peppers. And I don't really have a problem with rice, except that it just tastes like filler in a pepper. I want my filling to be nice and meaty to compliment the pepper cup. So I got a little creative with this recipe and used a white wine base to give a slightly sweet hint to the usual savory. And if you're like me and don't like tons of leftovers that you'll be eating for days or you're looking for meals you can prepare ahead, these freeze wonderfully. Just skip the cheese topping and wrap the individual pepper halves tightly with wax paper or saran wrap and place in freezer bags. When you're ready to cook, top with cheese and place in a preheated oven until the internal temperature is 160°F. Important: If you have the time, I highly recommend putting the sausage mixture into the fridge for a few hours; either prepare the filling in the morning or the night before or at least several hours before serving. There are two benefits: the flavors in the filling have time to meld together and really improve the taste and the cold filling holds together much better and makes for an easier time stuffing the sausage. This isn’t a required step, but just a recommendation. In a large skillet, heat ghee. Add Italian sausage and brown. When most of the chunks are browned, add onions, salt and pepper, and Italian seasoning. When the onions start to look translucent, add tomatoes. Cook 3-5 minutes and add garlic. Cook about 1 minute until garlic is very fragrant. Add white wine to the pan. Scrape up browned bits from the bottom of the pan and allow dish to simmer approximately 10 minutes on medium heat. The wine should slightly thicken and most of the liquid should cook off. Add basil and parsley and cook another minute. Remove from heat and allow to cool. Preheat the oven to 375°F. For the stuffing of the peppers, the size of the bell peppers will determine how many you need. Bigger ones while require more filling so you’ll need fewer “boats”. 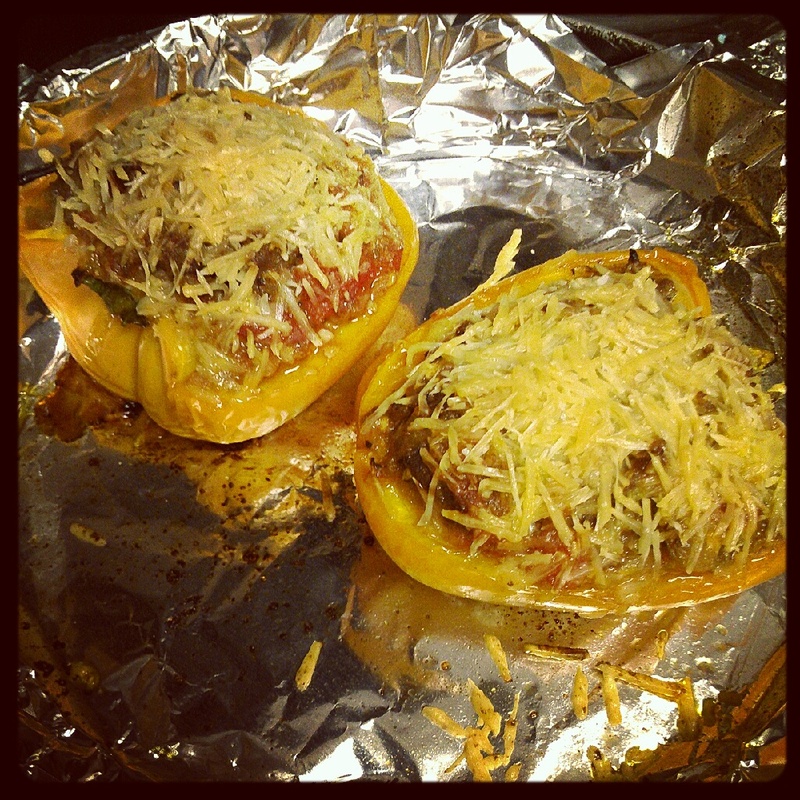 Cut the bell peppers in half lengthwise. It helps to figure out first which sides will remain as flat as possible and try to make them the bottoms. If not, shave off a little of the side to create a flat bottom; be careful not to create a hole in the side. Keeping the stem intact, cut out the seeds and the membranes. Stuff the pepper with desired amount of stuffing, trying to pack it in without breaking the pepper. Top with cheese if desired. Place in a small foil-lined pan or baking dish and cook in the upper part of the oven for 25-30 minutes until the cheese is melted and the internal temperature is 160°F.